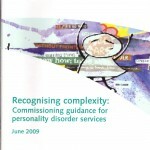 Personality disorder was not much recognised in the 20th century, but this changed after the British government made considerable sums of money available for public protection of ‘dangerous people with personality disorder’ (‘DSPD’) following the murder of Lin Russell by Michael Stone in 1996. Because Stone had been diagnosed as a “psychopath” and been declared “untreatable” by psychiatrists, the then Home Secretary decided that mental health legislation needed to be changed. The National Personality Disorder Development Programme was introduced and ran from 2002 to 2011, and extended the government’s interest to mainstream mental health (community PD) and preventative work for young people (emerging PD). It was launched with the publication of “PD No longer a diagnosis of exclusion” to support service development and “Breaking the Cycle of Rejection” to set a framework for training and workforce development. This website brings together these different aspects, and supports the next phase of development – which will be led by those with a professional or personal interest in the field. the forensic programme (originally DSPD) has moved from a focus on intensive treatment programmes, to making whole system changes which will ensure that the mental health aspects of offending are properly addressed throughout the criminal justice services. the young peoples programme has set up twelve pilot Multi systemic therapy (MST) sites which are being experimentally evaluated with a formal trial, and has links to other initiatives in education and social care. the workforce development framework has produced an extensive programme of training activities, collectively called the ‘Knowledge and Understanding Framework‘.